This report assesses 56 countries—which comprise almost 90 percent of the global economy—on 27 factors reflecting the extent to which their economic and trade policies contribute to and detract from innovation globally. The report finds that on a per-capita basis, the nations doing the most for global innovation (a combination of more effort on policies that support innovation and less on policies that harm it) are Finland, Sweden, and the United Kingdom. In contrast, India, Indonesia, and Argentina score the lowest overall. Singapore, Korea, and Finland rank highest on how much their policies contribute to global innovation. 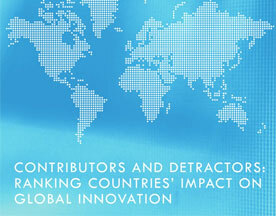 In contrast, India, China, and Thailand have put in place policies that have done the most to harm global innovation. The United States ranks 10th overall, with policies that do little to detract from global innovation yet fall short of those of other nations when it comes to contributing to global innovation.